How to play Player Unknown Battleground (PUBG) after banned ? Last year PUBG was launched all over the world. As soon as the release of this game, People got such addiction that now some countries are thinking of shutting it dow. Where the game is already banned in China , now rumors are spreading in India too. Because the people have been misquoting it. The biggest wrong impression of this game is on India. The students are on such addiction of this game that most of the students are bunking their classes for this game and then those people are not even right to take the exam. People now wasts hours after getting that precious"winner winner chicken dinner." That's why Indian government now thinking to ban this game for better future of students. A few day ago Vellore Institute of Technology (VIT) had banned PUBG from it's campus. According to VIT the game PLAYERS UNKNOWN BATTLEGROUNG is spoiling entire atmosphere of the hostel. In a notice VIT says," It has come to our notice that few students are playing online games like PUBG which is not permitted. Despite our related instructions by playing online games insides the rooms which disturbs fellow roommates . It is strictly warn that playing online games and betting for such games are totally prohibited in VIT . Hence the defaulters will be dealt seriously under VIT code of conduct. Students are asked to concentrate on physical games or sports and give more importance to their career growth." Is it really possible to play PUBG after banned ? Yes, definitely you can play PUBG after banned by using VPN. The VPN is the only way to play PUBG even after banned. Now, what's this VPN ? I don't think that people who play games like PUBG are not familiar with VPN . But still I tell you that VPN (Virtual Private Network) is a technology that creates a safe and encrypted connection over a less secure network, such as the internet. People who uses VPN are to hide their existence from internet. By using VPN you can alter your Ip adrees with other countries. So, that nobody can trace you or locate you and you can do your work without any fear. If you are PUBG addicted and still want to play after banned you can simply use the VPN to play . 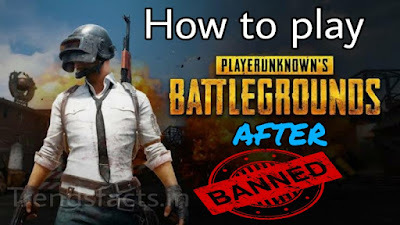 So that's all about How to play PUBG after banned . Hope you enjoyed it . Thank you for been here. Due to which gaming Industries has grown up so much. It is available on low-end phone to all ranges phone,it is easily available or accessable and has great graphics due to which it has grown attention in youngsters and teenager devoting time . Now due to college and Indian education system it is going to banned .